ERBIL, Iraq – We were about 20 miles outside the occupied city of Mosul, the Islamic State’s capital in Iraq, when the signal came in. When, miraculously, I landed on the welcoming wordplay of Eminem’s “Lose Yourself,” and did just that. I got lost in the thought of being home, in Detroit, far from the front lines. It reminded me how music has the power to change people’s lives, to bring hope. I was about to meet a young Assyrian from Detroit who has risked his life for that possibility. Enter Noor Matti, the DJ behind the Eminem track that came on that day as our news team cut along the Kurdish side of ISIS-infested badlands near Mount Sinjar. 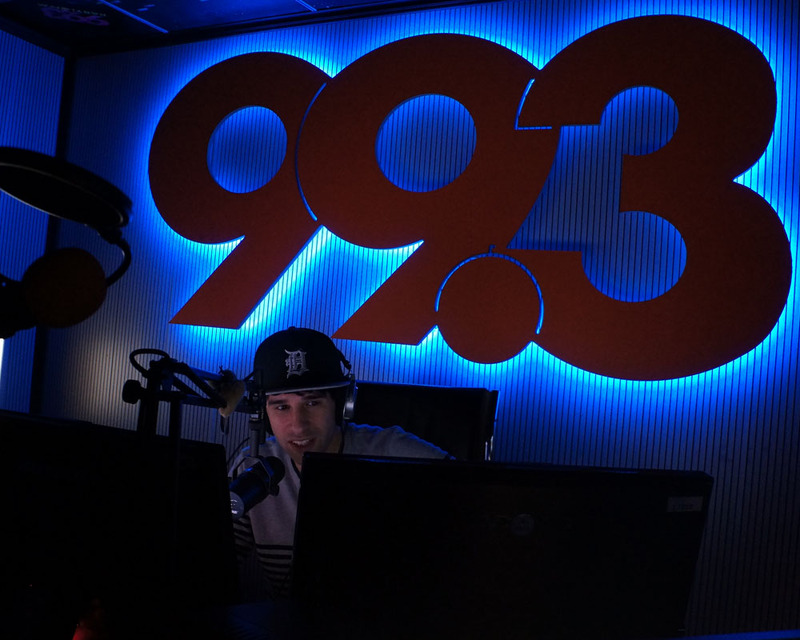 From 8 to 10 every morning, the 31-year-old Matti hosts the Detroit-themed Breakfast Club on 99.3 Babylon FM, the only English-language radio station in Iraq. The program is broadcast from Erbil, capital of Iraq’s Kurdistan region, some 45 miles from Mosul. The format is simple: Matti spins records and brings in entertainers and other guests from the region to talk about topics beyond the daily fare of war, refugees, turmoil and economic crisis. His musical interests lean toward hip-hop, more Big Sean than Motown; influenced by his years in Detroit before returning to Iraq. Another Detroit influence: phone pranks, which Matti exported from his favorite Motor City station. “Babylon FM is a door to Detroit, to Western culture,” Matti said of his show. It’s a message that appears to be finding a receptive audience among an estimated 15,000 listeners his program draws across northern Iraq, though the ISIS-controlled station in Mosul often tries to jam Babylon’s signal. Detroit civic and business leaders talk incessantly about the need to improve the city’s image as a place to raise a family, start a business and attract entrepreneurially minded immigrants who will create jobs. If so, Noor Matti is proving an unlikely ally in helping burnish the city’s cultural cachet among young Middle Easterners. Matti lives and works in Ankawa, a Christian neighborhood on the edge of Erbil where life contrasts sharply with the conservative, mostly Muslim city. The U.S. consulate is located in Ankawa, and the lively neighborhood serves as a haven for Westerners who work in the region, mostly for the United Nations, the oil industry or nongovernmental agencies. Women walk around at night without hijabs, and cafes and liquor stores line the streets. Recent violence and tension have threatened the freedom of this dwelling, however. In April, an ISIS bomb outside the consulate’s entrance killed three people and blew out a row of storefronts that remain vacant today. The street has been blockaded since the attack, the consulate more heavily fortified with concrete barriers. Security guards walk the area at all hours, Kalashnikov rifles in hand. More recently, anti-government protests in the Kurdistan region have prompted officials to close nearly all bars in Ankawa and place stricter rules on alcohol. In December, ISIS conducted military operations east of Mosul, as its fighters prepare for an expected American-led effort to retake the city. For Matti, playing American music, especially hip-hop, against the backdrop of Islamic extremism or Kurdish patriotic anthems is a political statement in itself. Local people generally love the United States (American Top 40 with Ryan Seacrest is broadcast twice on Saturday), even if they’re not quite ready to ditch centuries of tradition. Though ISIS routinely threatens pop stars and entertainers with death, Matti said he doesn’t worry about the danger. Matti was born in Iraq, a member of the Assyro-Chaldean sect. Chaldeans are an ancient branch of Catholicism, descendents of the people of Mesopotamia, and some followers still speak Aramaic, the language spoken by Jesus Christ. Their ancestral homeland is in northern Iraq, and the religion traces its roots there over thousands of years. Noor, his parents and sister joined dozens of relatives fleeing the country in 1992 after the first Gulf War. By foot and car, they fled from Erbil to Turkey, where he said they were jailed for three months. His family piled onto a boat bound for Greece – the same deadly route thousands are now taking to escape ISIS. Eight years old at the time, Matti said he will never forget the cold, miserable trip, or the relief he felt when seeing land. Jailed again in Athens, he said his family was granted refugee status by the United Nations High Commissioner for Refugees. They applied for U.S. citizenship, then waited for two years before getting approval to move to the U.S. They eventually settled in metro Detroit, with its large Chaldean population, and gained citizenship. Though safe from the violence plaguing his homeland, Matti said the transition was not easy for a 10-year-old boy from Iraq. Noor found solace in music. “I remember first hearing Eminem on 93.1 (WDRQ-FM), and from that moment music just went into my blood,” he said. Matti and his family eventually adapted to life in their home in Warren. They started businesses in Detroit and surrounding areas. Matti created “Noortorious Media” at Fitzgerald High School, made friends through sports and interned at a video production company, work he loved, but his parents rejected. “Like all immigrant parents, they wanted me to be a doctor,” Matti said. He graduated with a bachelor's degree in biology from Wayne State University in 2008, at the peak of the city’s economic and political crisis. He said he was accepted to study optometry but lacked the money or desire to enroll. He bided his time parking cars at a Detroit hotel and weighing his future. The answer, eventually, was back in Iraq. Matti returned to Iraq in 2008 with no family except a few cousins and an uncle. But with a bright smile and extroverted nature he soon made friends, earning cash as an English teacher. It didn’t hurt being from Detroit, either; both places, Matti said, share an underdog, climb-to-the-top mentality. So when Babylon Media launched an English-language station, Matti was determined to take its reins. The company had only been in Erbil a few years, and was perhaps best known for “Kurdish MTV,” which plays Kurdish music videos 24-7, along with a radio station that caters to refugees. “Promoting the values I learned in Detroit is a matter of survival here,” he said one day recently inside his studio, wearing a flat-brimmed Detroit Tigers cap, loose and a bit crooked. “Perseverance, peace and acceptance – it’s hard here because of ISIS and extremism,” Matti said. His radio show has found a niche with a younger audience that has embraced Western culture in a country that fiercely opposed it for years. His show is more than just playing top hits. It’s a platform to discuss ideas buried by the region’s mainstream conservative culture. And to have some fun. Take, for example, radio segments he learned in Detroit and integrated into his show in Iraq. Every week, he does a prank phone call bit inspired by the classic “War of the Roses” (exposing cheaters) and “Phone Scams” from the “Mojo in the Morning” show on 95.5 WKQI-FM, which he always tuned into back in Detroit. His phone victim, Matti admits, was actually a friend of a friend and took the joke in stride. Airing such material in Iraq, he said, is a delicate process and those he pranks are at least acquaintances. “We couldn’t actually do “War of the Roses” here because people would get killed over that,” he said. Matti’s music selection pushes boundaries just the same. Detroit stars Eminem and Big Sean are staples in the mix, painstakingly edited to avoid backlash, and he’ll sometimes throw in Kid Rock or Madonna. The DJ pulls from local talent, too. Kurdish pop star Helly Luv, who made a name in the industry by filming provocative music videos on the front lines of war, sat down with Babylon before many in the world knew her name. The show also hosts an underground rapper named Frank Flo from Ranya, a Kurdish city near the Iranian border; listen to Matti’s entertaining interview with Flo here. Inspired as well by Emimem, Flo has never left Iraq yet delivers lyrics in perfect English with flair and plenty of expletives. While Matti and his guests work to create a more promising future for the people of Iraq, the reality outside of the studio looks bleak. In 2014, when ISIS began capturing large swaths of territory in Iraq, digging in dangerously near to Erbil, Matti’s parents urged him to return to the U.S. He said he couldn’t abandon his homeland because of another value he learned from Detroit: loyalty. Matti said he knows extremism and violence in Iraq will be around for many years to come. He knows his mother and father want nothing more than for him to return to Detroit, the place of refuge they risked their lives to move to in 1992. While Matti’s family is comfortable in their lives in metro Detroit, the privilege of having been able to escape violence drew Matti back to it, he said. The opportunity of helping those in need gives his life purpose. “I’m going to do good with my American passport; not use it to escape,” he said. His time in Iraq has also given him a different, harshly critical, perspective on U.S. policy in the Middle East, which Matti contends has actually made life more difficult for its people. “One living in America doesn't usually ask why the U.S. is allies with terrible nations such as Saudi Arabia,” he said. “But you do start asking that question when you live abroad and see things from a closer view." In response to the persecution of his people, Matti created the Shlama Foundation to aid refugees and connect the Chaldean diaspora in Detroit to the homeland. Since August 2014, he said he has raised more than $90,000 for food, housing and medical aid, all of which he and volunteers distribute directly. Most recently, Matti set out to the Nineveh Plains, just miles from ISIS positions, to provide shelter for over a dozen families that escaped the terror group. Matti knows the security situation could change instantly and without warning. “ISIS could decide to come here at any moment,” he said. Just a few miles from Erbil, entire villages have been leveled by airstrikes and artillery fire, often with families inside who had no warning of impending slaughter. There are 4-year-old Syrian children living in the streets with no food or water, begging motorists for money so their families can survive. Women give birth in squalid refugee camps with no doctors or medicine. Kurdish peshmerga fighters have been beheaded and burned alive. But even here there is hope and Matti says that if Detroit can rise from the ashes of its bankruptcy and blackened global image, Iraq can rise as well. Music offers an escape no matter where it’s heard – in a war-scarred country plagued by religious extremism, or an inner-city neighborhood with little opportunity. The DJ has made his choice. He is committed to offering his audience what he was given two decades ago when he survived the boat ride to Greece: hope ‒ with a soundtrack from Detroit. For more information on Noor Matti’s foundation, visit its website. To hear the Breakfast Club via livestream, visit Babylon FM online. Kurt Nagl is a reporter with Michigan roots. His most recent endeavors took him to northern Iraq, where he reports on the war against ISIS, the refugee crisis and related issues. Kurt, thank you for sharing this inspiring story with us. Having the courage to promote a sense of normalcy and progress in the face of what is happening in his home country makes Matti a hero in the truest sense of the word. Inspiring story this young Chaldean man tells. In 1984 I completed my M.Ed. thesis at Wayne State University on the Chaldean people's immigration to Detroit from the early 1900's to build a vibrant and lively community here. I was always impressed by how the local community helped and supported its brothers, sisters and cousins who came to the United States. Many other ethic communities have done the same for hundreds of years. It is one of the proud roots of American society. My thesis was published by U of M Microfilms in 1984 and it was the second English language thesis/document written about Chaldean history in Detroit. Kay.